First real scope! 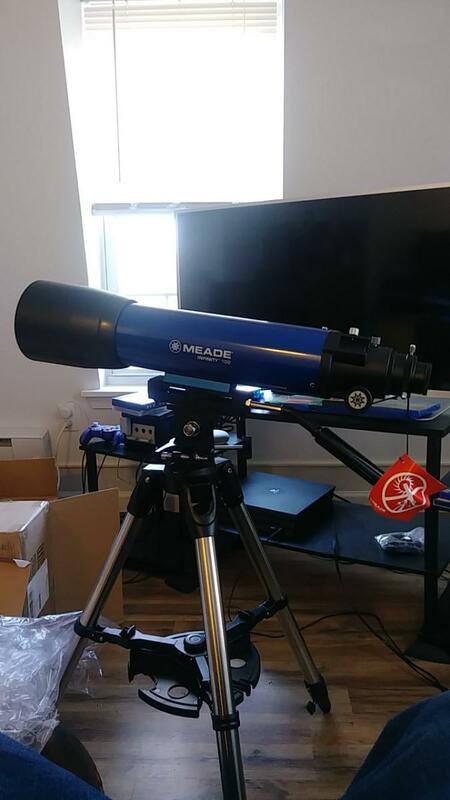 Just bought a Meade Infinity 102mm on an Az mount! Hello everyone! Super excited today as I just bought a Meade 102mm, it will be here tomorrow! I know its not the biggest and best but at the price and the dozens of overwhelmingly positive reviews I read, I decided to take the plunge. This is my 1st real scope, I recieved a cheapo for Christmas, when I was 10, and could barely see Venus but that might've been my inexperience. Although it came "brand new" in a very sketchy box so who knows. I've read the planets will be very clear, especially Jupiter and Saturn, with this scope along with bright stars and the Orion Nebula. What else should I try to find? Also how visible would VY Canis Majoris be in the winter? All help will be greatly appreciated since I'm completely new at this and still trying to wrap my head around all the new terminology and math😁. Congrats! Have fun. Orion Nebula will look good. I suggest you just scan around with the scope, you'll run into some very interesting things in Orion, Canis Major and all the constellations that the Milky Way runs through. VY Canis Majoris will be visible in your scope at night now, it's an interesting star to keep an eye on over years as it's brightness changes. I suggest something like Sky & Telescope Pocket Sky atlas, and beginners book like NightWatch to get you going. Enjoy! Congrats, 4” refractor can show you a lifetime of cool stuff. You might consider getting a copy of “Turn Left at Orion”. Will give you some great targets to track down with your new scope. My missing size scope - around 4”. Very nice size scope and I’m sure you’ll get a lot of use from it. Be sure to update us with a first light report on what you see. I most definitely will give a first light report, I cant wait to have a real telescope! That’s a nice little scope to learn the sky. Visit the general observing forum, you could get many great advices starting a thread about " what’s in the sky tonight through a 4" refractor". Edited by AxelB, 21 March 2019 - 07:55 PM. All help will be greatly appreciated since I'm completely new at this and still trying to wrap my head around all the new terminology and math. Sally forth, and conquer the cosmos. Congrats on your new scope. The Meade 102 comes with a basic Alt Az mount, so you will have to hunt down those objects on your list manually (part of the fun). If you're new to this hobby, a pocket-size star atlas would be very handy in helping you locate them. There are quite a few free ones available for your phones or you could pay very small amount for more sophisticated ones like Stellarium Mobile. I went this route to get my copy. It looked brand new when I received it. A great atlas in a nice spiral format. Update, just got the scope today and its a beauty. I didnt have a whole lot of time before work, but since its so quick to assemble I had it together in less than 15 minutes. So far this has surpasses my expectations and the build quality seems pretty good the only thing that is loose is the quick adjustment handle but it settles quickly and offers very clean and stable image. Clear Skies to you all and thank you for all the advice. I'd almost rather manually hunt for stuff, so I can learn the night sky. I plan on buying one of the pocket sky atlas but for right now I downloaded SkEye it has a dark mode as well so not to kill night vision. but at higher powers, the mount will drive you crazy and bounce around. But....under 80x, you will have a lot of great things to look at, and a lot of light.. Which ones would you recommend? I don't mind spending a little bit more to have something more enjoyable to use. Congratulations on your new scope. Post a picture when you get a chance. Here she is! Unless you mean a photo through the lens😁unfortunately its going to be cloudy the next couple of nights but I'm going to try and at least see the moon. Edited by maknswarf, 22 March 2019 - 08:21 PM. Brother, you already know I've got this exact scope OTA. I love it at F/5.9. Three baffles inside which contributes to surprisingly nice contrast for such an inexpensive 4 incher. I also had the Celestron Omni AZ 102 and compared them side by side and I like this OTA better. They both give same quality views (same on planets and Orion) and both have very good optics and coatings for their price but I just preferred the Meade's shorter tube and focal length along with the lighter weight front end dew shield. Both are of the nicest of the beginner scopes but the Meade is cheaper and a very reasonable price at under 200 bones. I got an Explore Scientific AR102 with the idea of selling my Meade Infinity OTA but I love it so much I'm keeping it. A very nice Grab 'n Go Travel scope and light enough to use on whatever light weight mount you want. Brother, I'd recommend whenever you get to the point you're ready to upgrade to a better more expensive scope (or different kind of scope), keep this one. It's just a nice little lightweight scope for the money. Hands down. Definitely won't sell it😁 I'm a nostalgic kind a guy and I think it would be cool to have your 1st scope be a lifetime scope even when I get the bigger and better ones. Plus it just wouldn't be worth it to sell in the 1st place since it was so inexpensive to begin with. Edited by maknswarf, 22 March 2019 - 09:19 PM. That is a good looking scope. I think 4" is the best all-around scope. Just upgrade that mount and eyepieces and you'll be set for years of observing.